Clean grills after each use and make sure that all grease, fat and food particles are removed. Store clean grills and smokers in a secure area that keeps bears out. Burn off food particles on your outdoor grill after each use. Clean or remove the grease pan. Do not dump drippings in the yard. 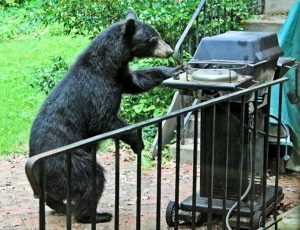 If bears are active in your area, store the grill indoors. Leave the propane tank outside (propane is a fire risk). 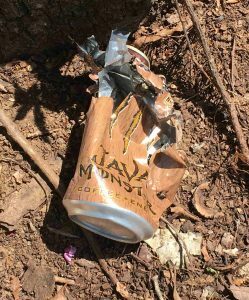 Don’t burn trash in campfire pits or camp grills. Food waste, including the residue left by “empty” containers usually does not get burned adequately to remove food smells. Don’t give bears a reason to linger around campsites! Put your waste in the nearest available trash container, or pack it out. After each use, clean the campsite area and grill, even if you are camping at the site for several days.